Families across America are looking to downsize. 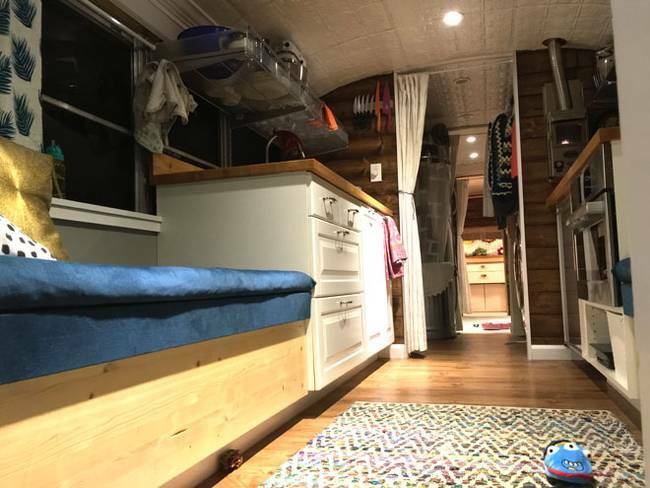 And some families are finding that tiny home living is the best way for them to do that. 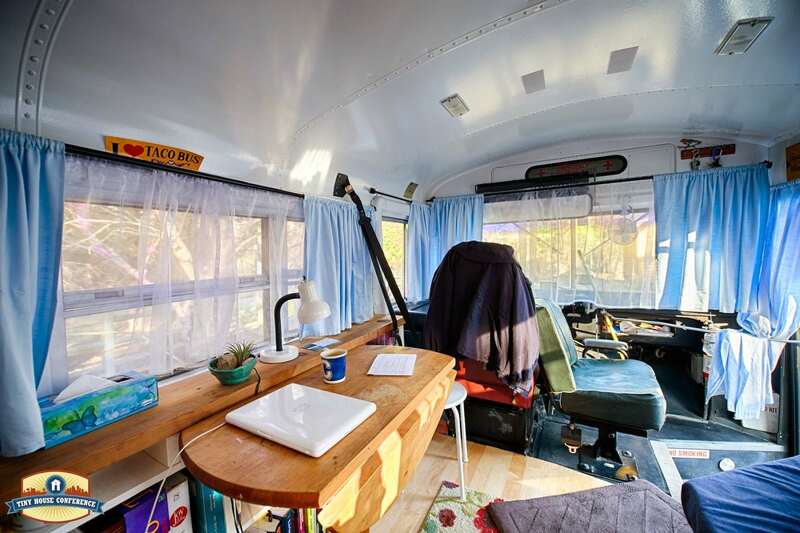 Lots of families have turned old buses into mobile homes. Brian and Starla Sullivan were tired of having rent costs take such a big chunk out of their finances. 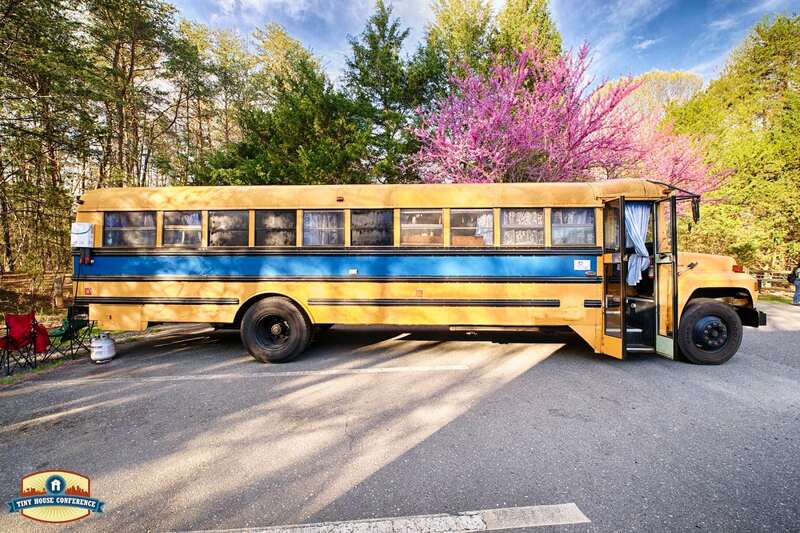 So they bought a used school bus for $2,800 and renovated it for $25,000. Now “Big Bertha” is the place they and their three children call home. Past the entrance to the home is the home’s main corridor. It houses the living room, kitchen, and dining room. This area also has storage space and allows for maximum family interaction. This cozy looking bench doubles as storage space. You can lift the top to get to the hidden storage space below. You can fit a lot of stuff down there. This kitchen offers lot of space to cook meals. 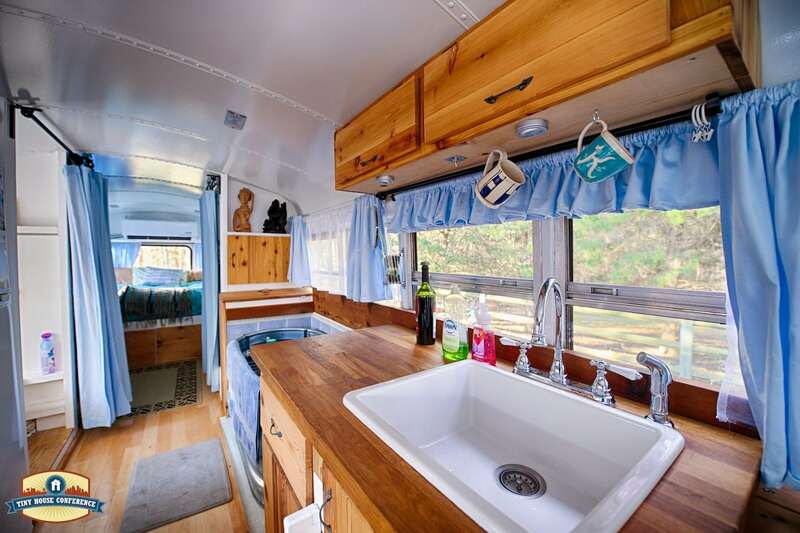 There is a huge countertop, as well as a standard sized sink. 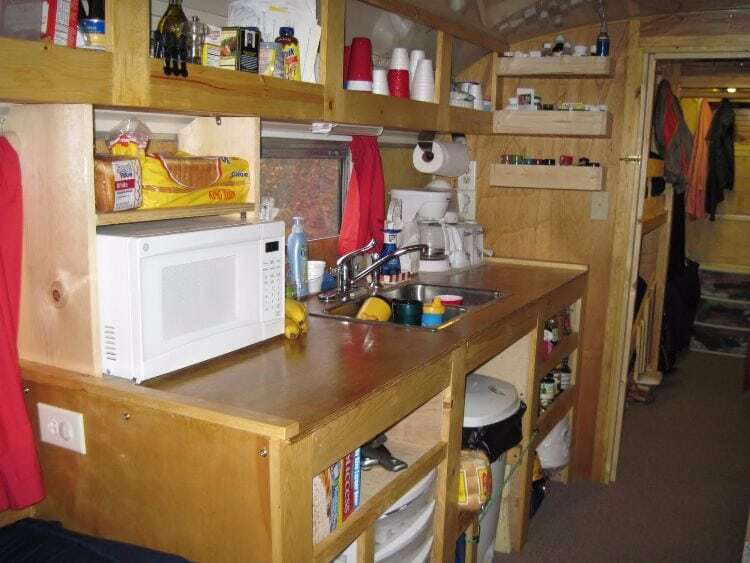 This kitchen also has a fridge and combo oven/microwave toaster. 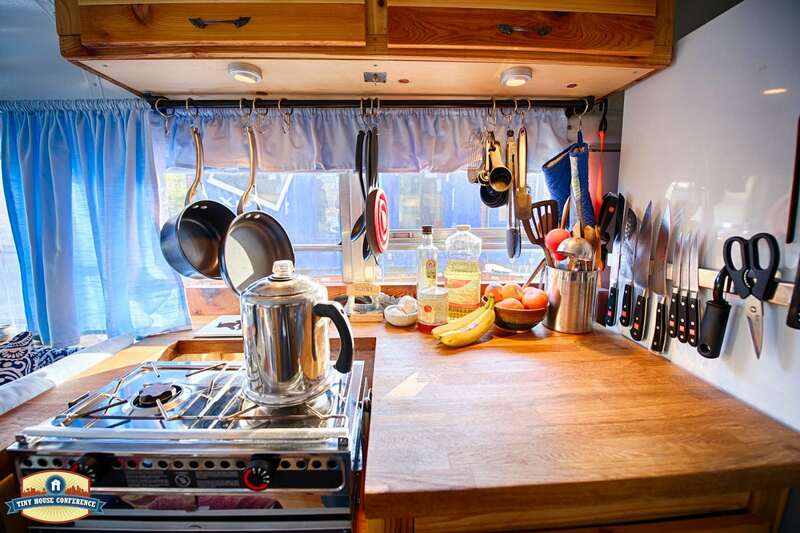 This kitchen also features a portable stovetop, but it has to be store away when its not in use. That’s why they created kitchen shelving to store appliances and other kitchen items. 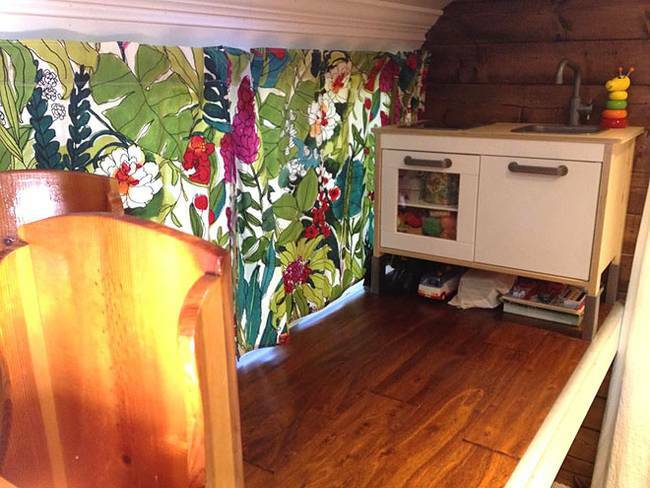 The Sullivan family also made sure to create plenty of space for them to store foods and other goods. To achieve this they created sliding draw space. It stays hidden and can be pulled out when needed. The family’s bathroom is located just past the kitchen. 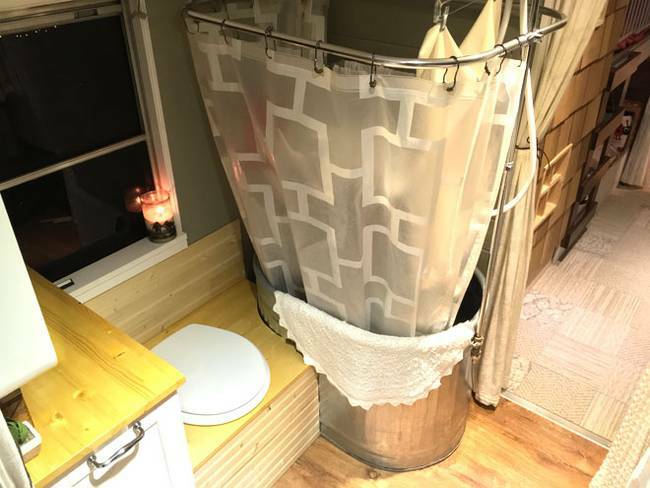 It has a composting toilet and a tub and shower made from a horse trough. It also houses the washing machine. The family doesn’t have a dryer so they hang their clothes to dry from any surface they can find. The shower rod works well for this. 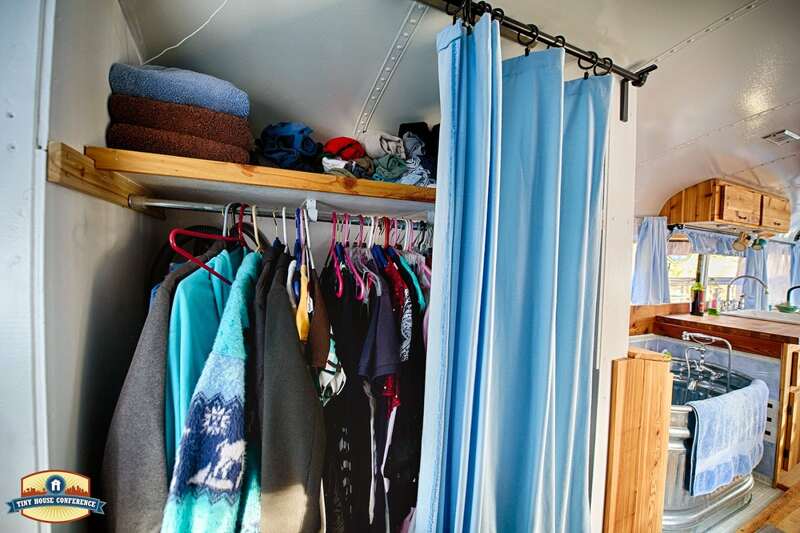 “We have learned to hang laundry on pretty much every surface in the bus since we do not have a dryer; everything air-dries,” Brian told Treehugger. 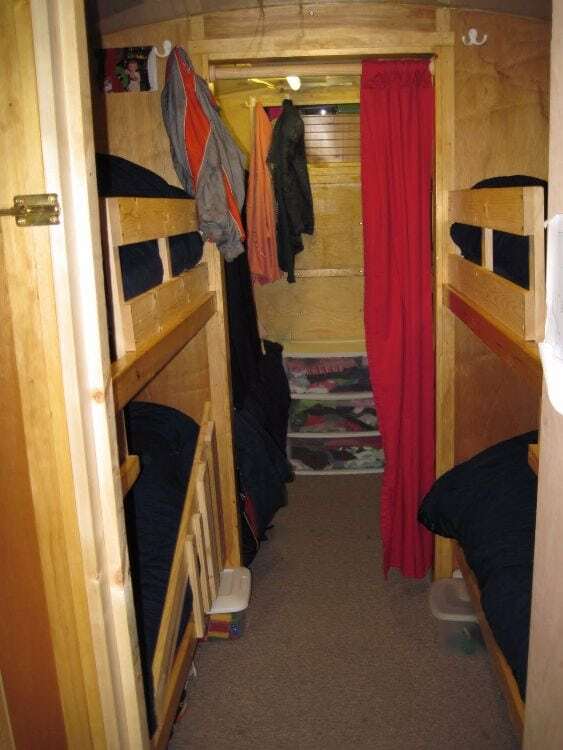 The Sullivans designed three bunk bed spaces that can be accessed with a ladder for the boys to sleep in. The space also includes a small window. 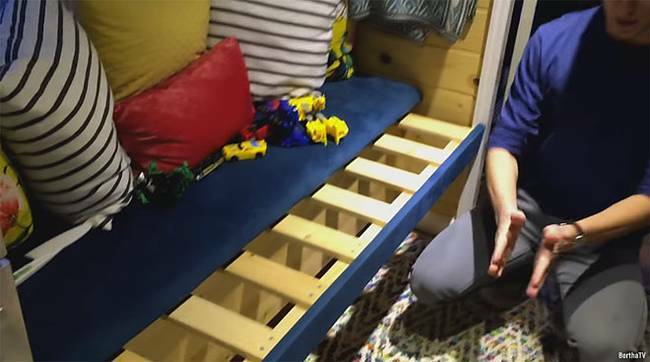 The bed bunks were made to be 7-feet long so that the kids could grow into them. One of the three bunk bed areas is reserved as a play space for the boys. It’s known as the “playroom. There is a place for toy storage underneath this area. 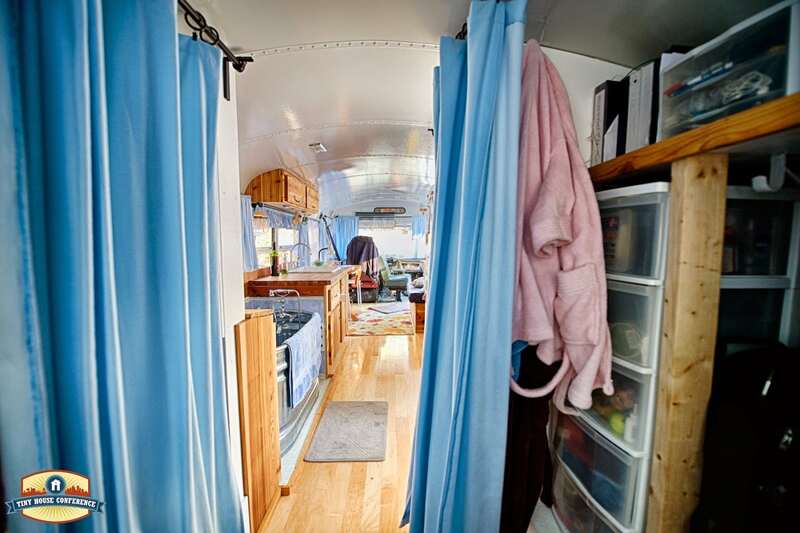 Brian and Starla’s bedroom is located at the back of the bus. It includes a really large and cozy bed area. There are drawers built into the bed for clothing storage. Those seating/storage benches have a third purpose. These benches have extensions so you can turn the space into a full-sized bed for visitors. The piece just slides right out. The driver’s seat and entrance to the home is separated by a door for safety. There is also a small desk in this area that serves as a little workspace. This area leads to the main corridor of the home. 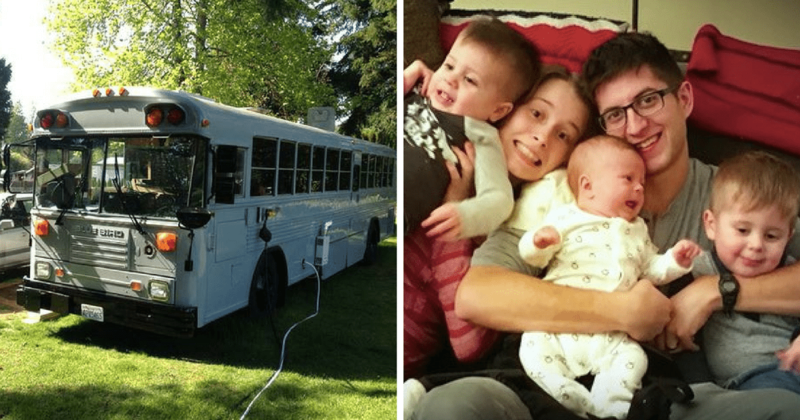 Jeff and Missy Miller were tired of being turned away from hotels that couldn’t accommodate their large family. So they figured out a way to save money and never have to worry about where to stay again. They converted a Blue Bird International Bus to accommodate their family of 9. The entrance of the bus is just past the driver’s area. 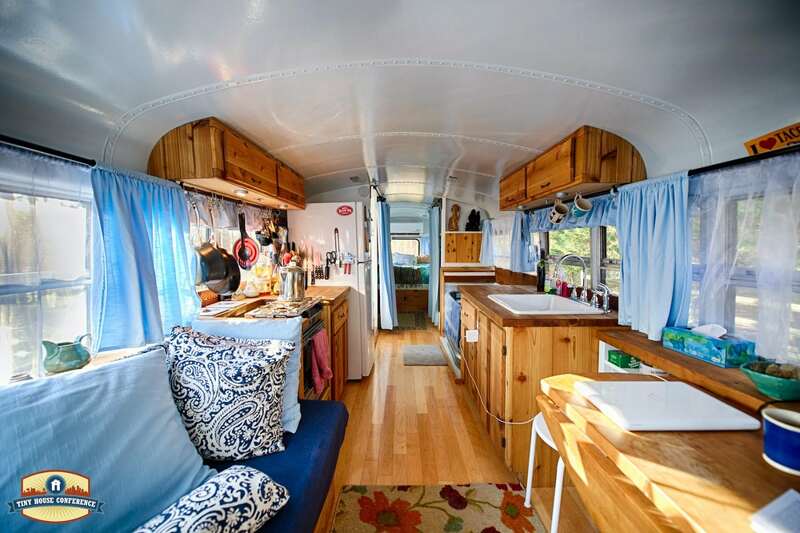 It spills out into the sleeping space/sitting area, kitchen, and goes back toward the bunk area. Jeff sleeps on the couch/bed space. 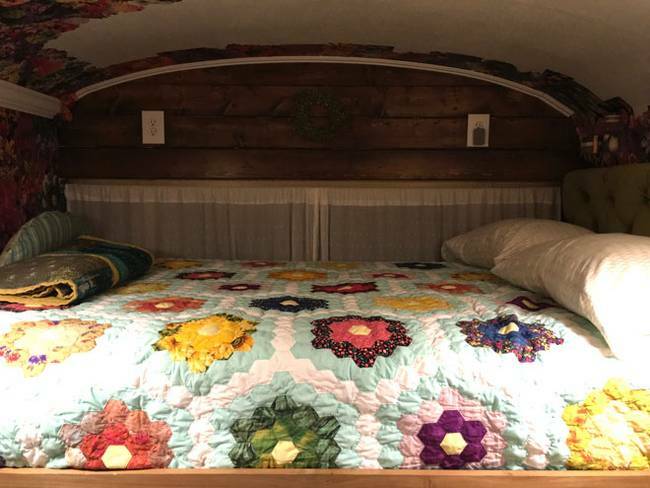 Beneath the bed includes storage space for linens and other items. 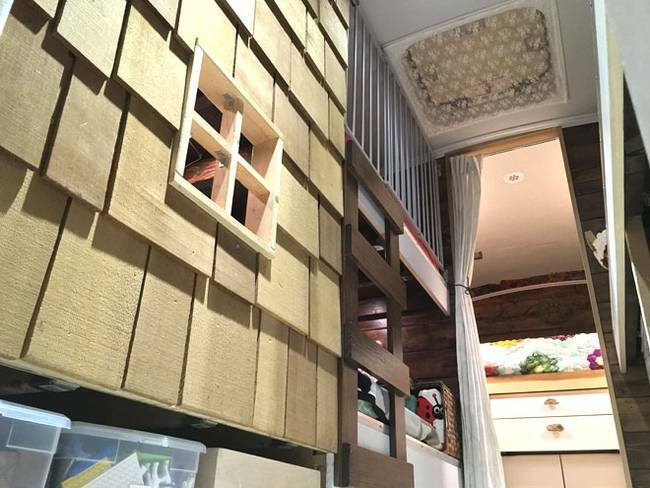 There is also shelving above the bed for pantry storage. Missy’s bed space is across from Jeff’s. 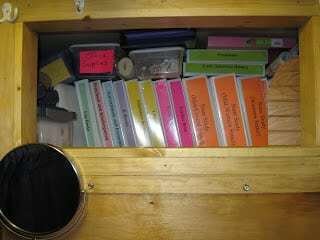 There is also extra storage space under her bed for homeschooling books. The area also serves as a couch or seating when the bus travels. The car seats can strap in this area. The kitchen currently doesn’t have doors on the cabinets but there is enough storage space, and a large counter space. 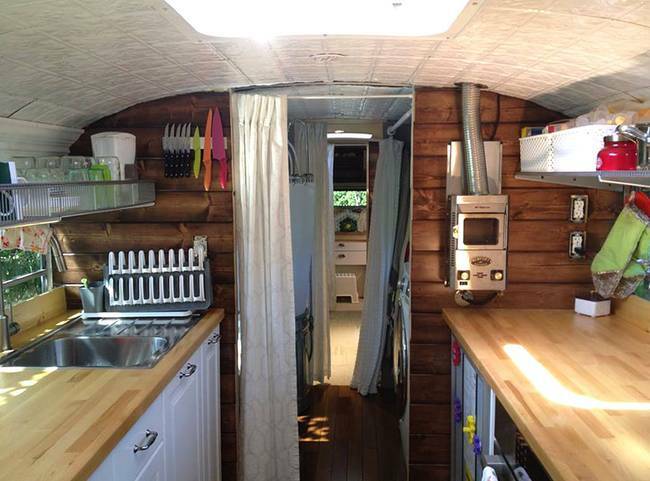 The kitchen has a full sized sink, microwave and bread box. With a family this large, you need a full sized refrigerator. And they do. Above the fridge is more storage. 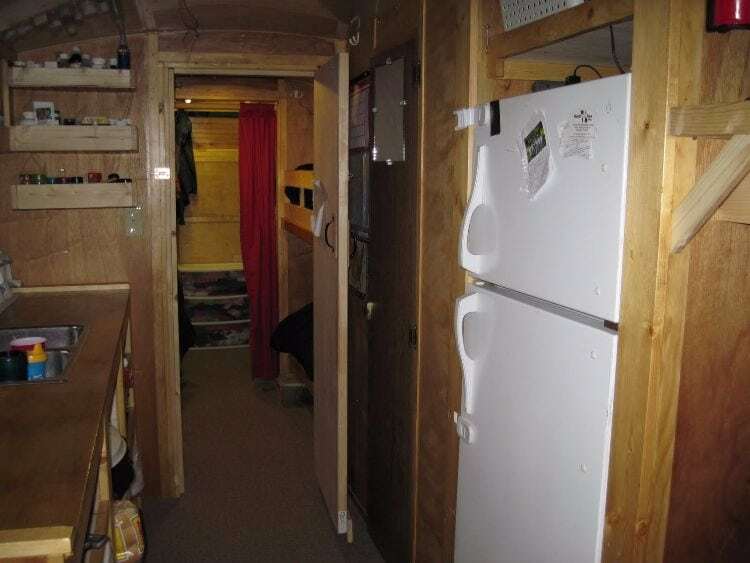 The bathroom door is behind the bunk area door. 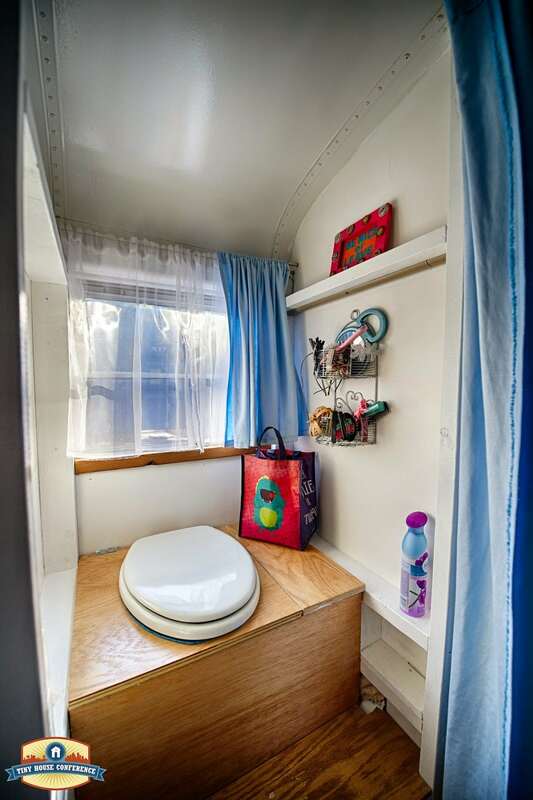 It has a toilet and two shelves. The shelves hold supplies. 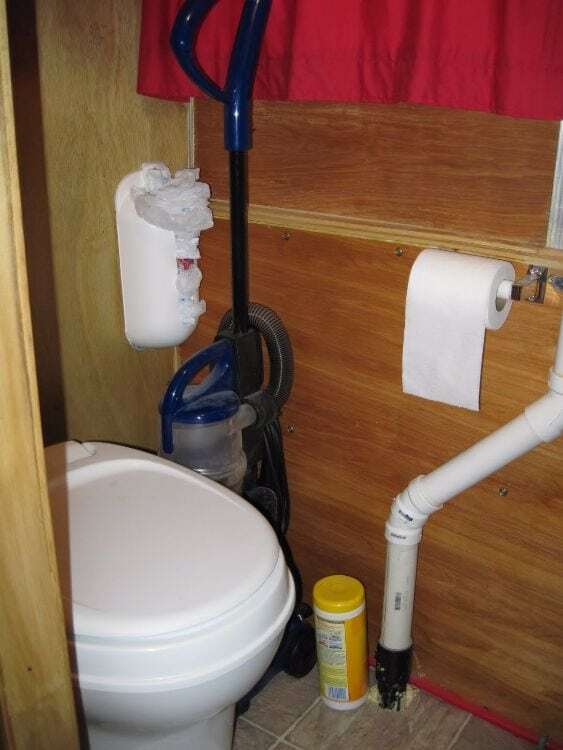 There is also a closet in the bathroom. Jeff and Missy store some of their clothes here. Some of the children’s clothes are stored in there as well. The home also has learning walls. 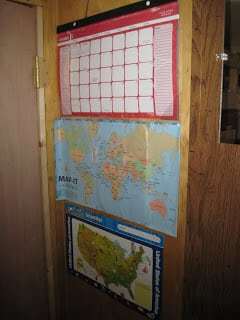 They have things like maps and calendars on them which help aid the children in being homeschooled. They also have a timeline on the ceiling above Missy’s bed. 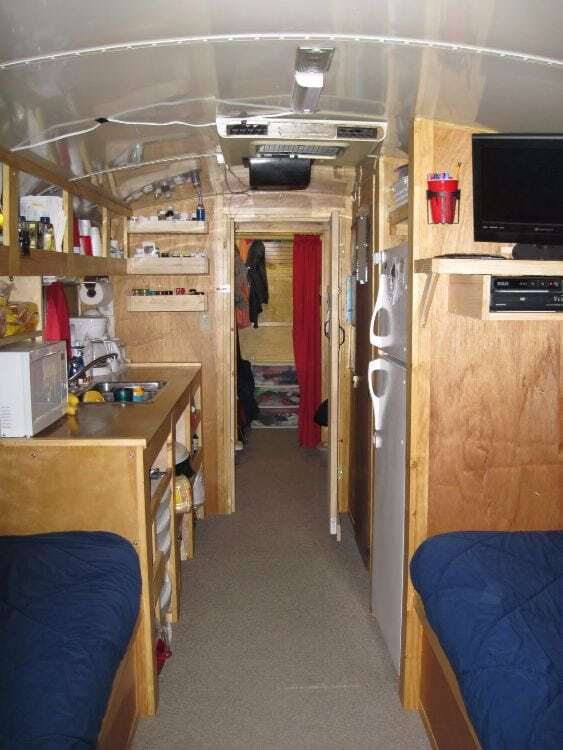 Here is the hallway leading toward the bunks. Jacob and Hannah sleep on the left. Joshua and Andrew are on the right. The back area is the girls’ area and separated by a red curtain where all of the girls change clothes. Many of the kids store shoes and toys under their bunks. 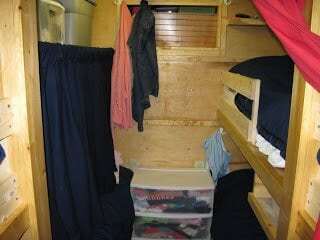 Each of the bunks has a hook so the kids can change their jackets. This is the girl’s section where Katie sleeps on the bottom right bed, Katie sleeps above Melissa. Sierra’s bed is on the left. Above that bed are a closet, dresser, and desk. This bus has all sorts of nooks and crannies for storage. 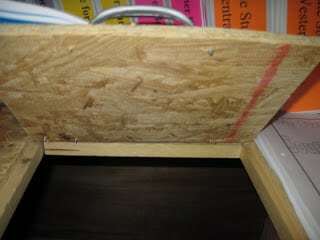 This area is at the bottom of Melissa’s bed and serves as a book rack. It also stores Melissa’s art supplies. With such a big family there’s going to be a lot of laundry. This shoot was designed so people can toss their clothes in. It lands in a basket and no one has to smell that laundry smell while on the bus. Just behind the driver’s seat is a fold out desk area. The desk is adjacent from a sitting area. This area flows into the rest of the house. 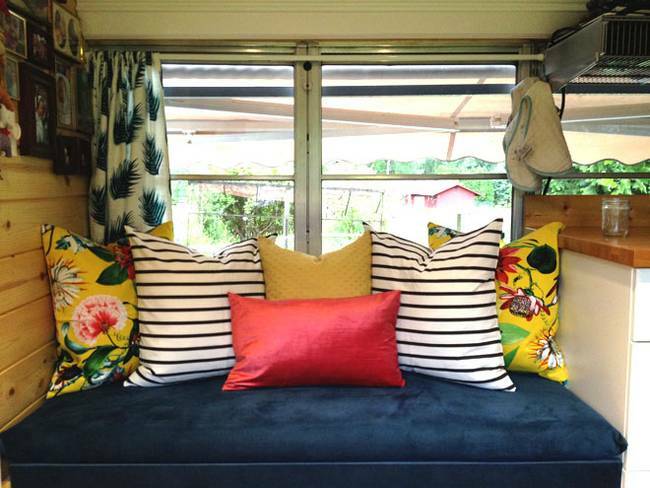 Chris and Kelly decided to start their home with a sitting area and fold-out table. That flows into a large kitchen. 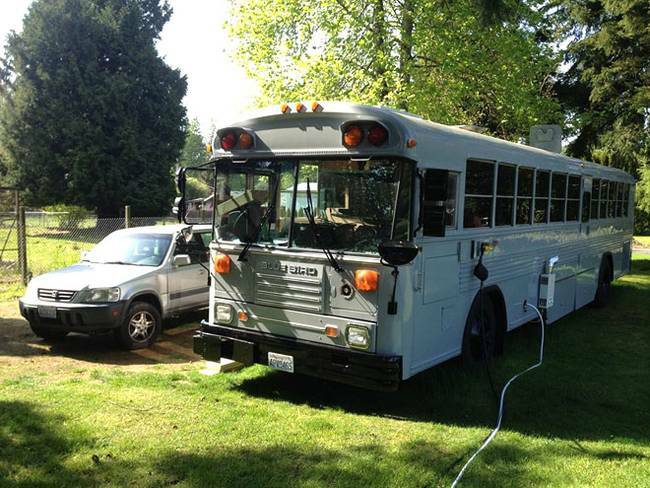 The bathroom and bedroom are at the rear of the bus. Chris and Kelly have a full-sized refrigerator and alcohol burner. They also have an outdoor grill to use when there’s good weather. They also have butcher block countertops. 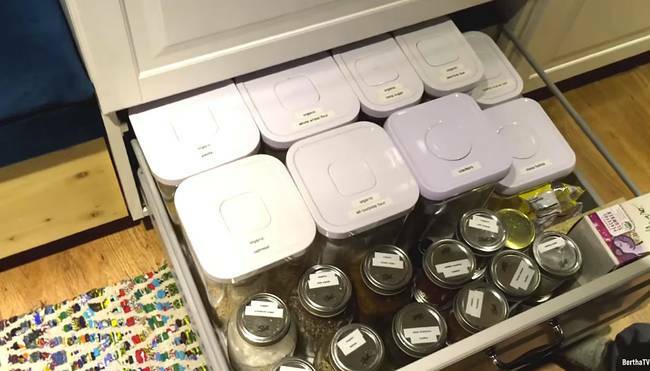 Chris and Kelly have lots of drawer and cabinet space in their kitchen. They also maximize on storage space by hanging their pots on pans. A magnetic strip holds all of their utensils. The right side of the kitchen is a full-sized sink. 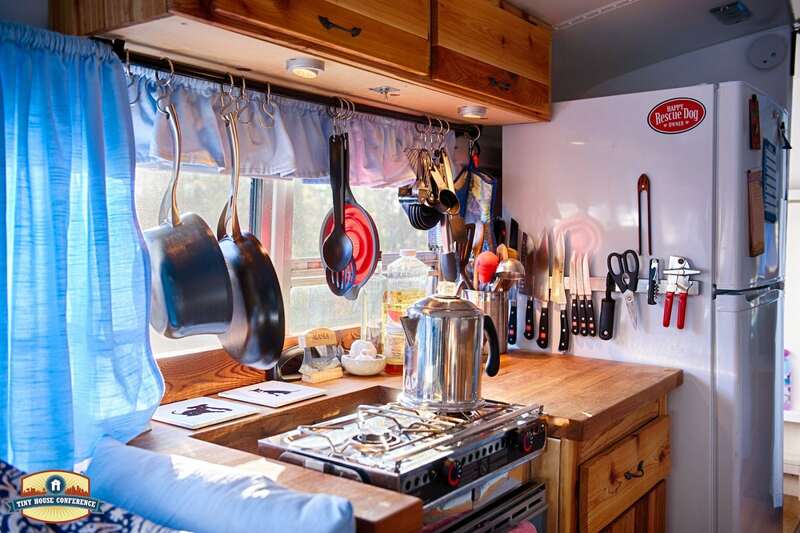 It’s surrounded by a good amount of counter space and additional cabinetry. Mugs are hung overhead. A one-of-a-kind trough tub can be found next to the kitchen. It’s what’s called a sitting shower. 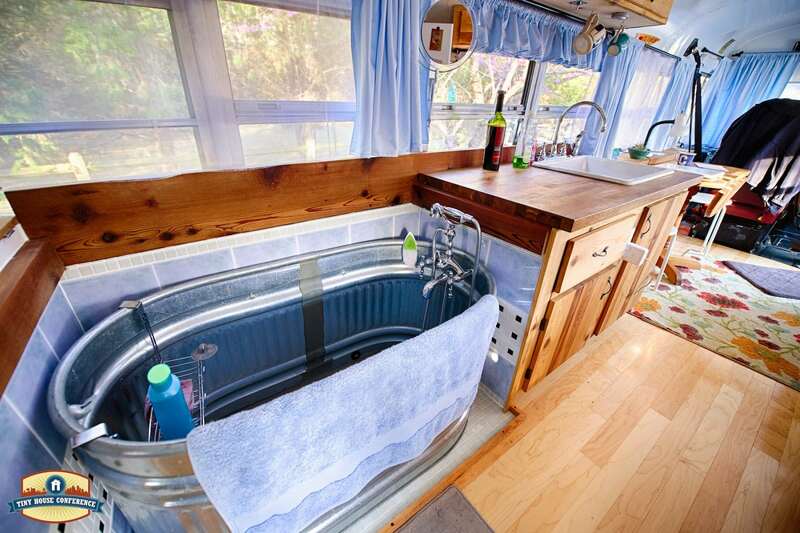 You basically sit in it and use a handheld shower nozzle to bath yourself. Chris and Kelly’s bathroom has a large sitting space. 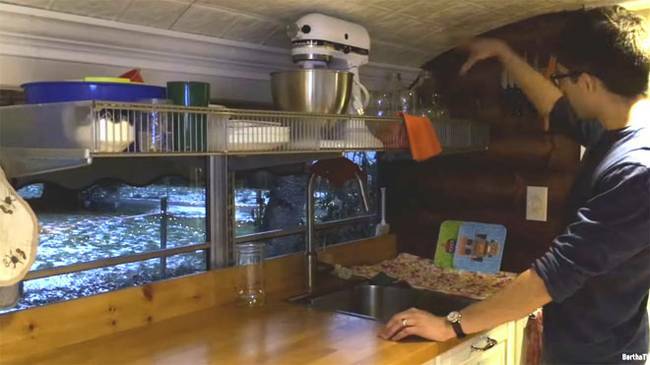 It uses a composting toilet so that the home can be fully taken off the grid. They hope to install solar power in the future. 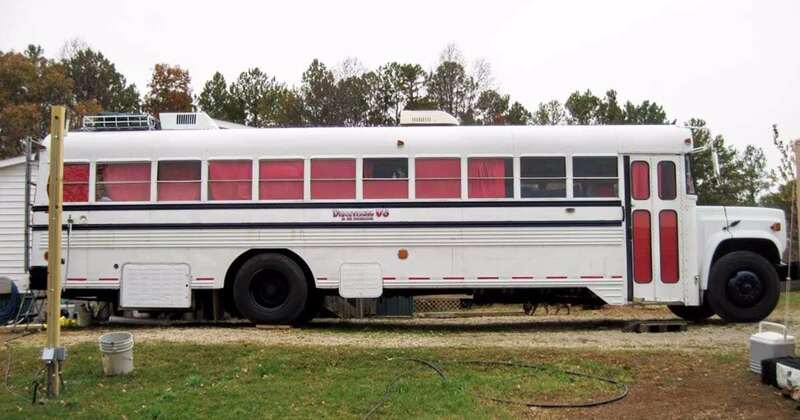 The end of the bus has two sets of closet space on either side of the bus. Closet one has a bar for hanging items. 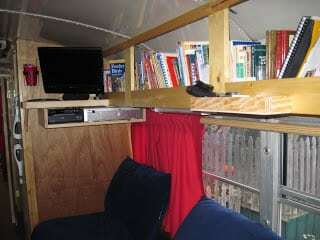 It also has a shelf for storing items above the rail. The second closet has built in cubbies and shelves throughout. It offers more than enough storage for the two of them. 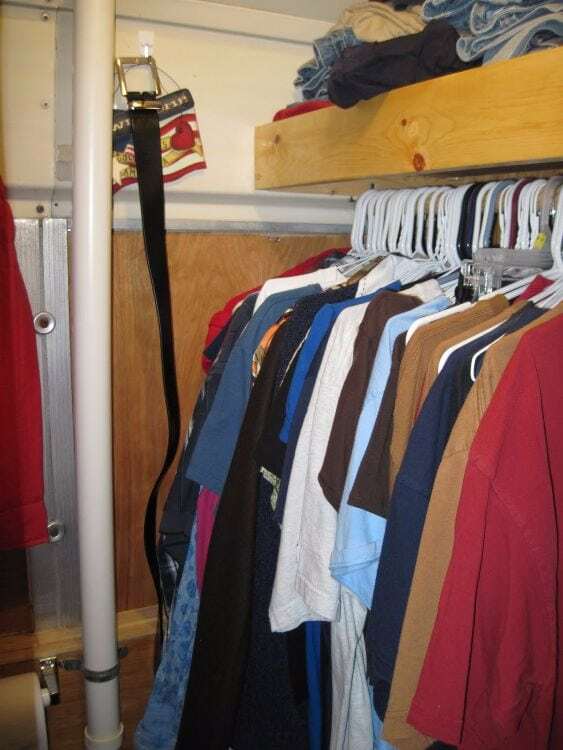 The first closet can be turned into a laundry room in the future if necessary. 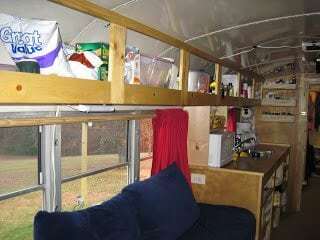 Chris and Kelly’s bedroom is located at the back of the bus. It has space for a large bed and some space to place things like a lamp. It’s also where the cooling unit is located.